With the fabulous response we've received for our Serenity ships, we are happy to continue with this line of ornaments. Last month we offered Inara's Shuttle, and this month we are pleased to announce the Reaver Ship. 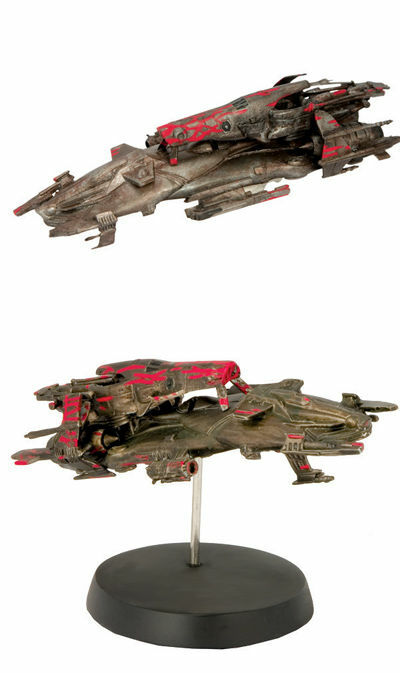 Fans of Firefly and Serenity will be familiar with the look of the Reaver ships, created from abandoned ships and spare parts, with their threatening red markings. In Serenity, the Reaver Ships emerge from an ion storm in the quest for Mal and his crew. We've based our ornament on one of the memorable, menacing ships in this scene. Legal Notice: Entire contents trademarked (® or TM) and copyrighted (©) 1986-2019 by Things From Another World, Inc. and respective copyright and trademark holders. All rights reserved. Page rendered at 2019-04-19 18:24:53 in 0.534 seconds.